Electrical shock is very serious. It can make your entire skeleton glow in a brilliant flash of light, after which you slump to the floor with your hair smoking. Or maybe that's just in the cartoons. In the real world, a good zap is a lot less cool, though it's theoretically possible for your hair to smoke. So what's the best way to prevent a life-threatening jolt? Call an electrician, of course. If you don't like that plan, at least do whatever you can to avoid the following no-nos, and understand that this is NOT a complete list. First of all, if you don't know what service lugs are, you shouldn't be doing anything in your breaker box (service panel) except resetting tripped breakers ... if that. If you happen to know that the lugs are the big screw terminals or posts securing the service cables, you should also know that they're always hot (energized), even after you shut off the main breakers. Obviously, you should stay well away from the cigar-size cables connected to the lugs, too. Definitely not a good smoke. This is another one for the "don't even think of it" category. The weatherhead, also called the service mast or periscope, is the metal pole or other structure that connects the electrical service lines leading from the utility power pole to your house. Since this is part of your house, you might be tempted to upright the pole if it's leaning or tighten a bolt here and there. Can the thought of 200 amps coursing through your body convince you otherwise? If you're a reader of builders' magazines, you've certainly seen photos of someone doing something dangerous without the recommended protective gear, along with the caption: "Don't do what this guy's doing." (And more often than not, the "guy" happens to be the author.) 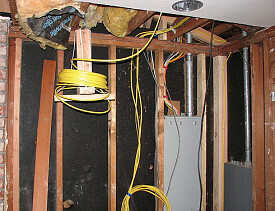 The point is, just because electricians sometimes work with hot wires doesn't mean it's safe for you to do it. It's not safe for them, either. Appliances are safe as long as you turn off the power or pull the plug, right? Ever heard of a capacitor? It's a device that stores electricity to help boost the startup (and other functions) on some appliances, especially big ones like air conditioning units. Cutting the power to the appliance doesn't discharge the capacitors, but a metal tool touching the contacts surely will. Yow. On the heels of this year's auto show—and the many new electric vehicles—keep in mind that the electrical systems in both plug-in and hybrid cars aren't just complicated beyond your wildest nightmares, they're also extremely dangerous if you don't know what you're doing. Here's a free nugget for the next cocktail party or water-cooler gathering: Electrocution means death by electric shock. Period. Like execution, there's no coming back and saying, "Man, that really hurt."